Sleep Enhancing Essentials Health Kit: Promotes Sleep and Emotional Well-being. Our Sleep Enhancing essentials Includes…. Circadian Sleep: Our NEW Circadian Sleep formula combines melatonin with a unique citrus-peel extract to encourage healthy function of both central and peripheral circadian clocks, respectively. MicroActive® Melatonin promotes optimal sleep-wake cycles, and Nobiletin from young citrus peel supports healthy expression of genes that govern your peripheral circadian rhythms. 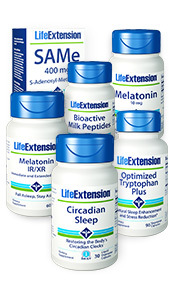 Melatonin IR/XR: An estimated 50 million to 70 million American adults have difficulty sleeping. Melatonin is a hormone made naturally by your body – but those who have trouble sleeping may not be producing enough of it at the right time. Melatonin IR/XR helps you fall asleep and stay asleep all night long. It combines immediate-release and extended-release melatonin for approximately seven hours of healthy sleep support. Optimized Tryptophan Plus: is made with premium-quality L-tryptophan, as well as nutrients like lysine, niacinamide, and more to help maintain tryptophan activity in the body. SAMe S-Adenosyl-Methionine – SAMe helps maintain stable mood and joint function without side effects. In addition, SAMe has multiple mechanisms of action that are used throughout the body, especially in the liver, which help maintain liver health. Largely known for its effects on optimal mood, SAMe has also shown benefits for the liver, brain, and joints. Bioactive Milk Peptides (Lactium®) are a cutting-edge nutrient complex consisting of patented bioactive peptides found naturally in milk. Used widely in Europe to promote sustained and restful sleep patterns, published studies reveal that these bioactive milk peptides also promote relaxation, help with stress, and support daytime cognition. Use Bioactive Milk Peptides daily to help deal with the stress and pressures of everyday life or before bedtime to support relaxation. Each capsule contains the very same patented Lactium® formula Europeans have used for years to help with sleep and stress-related issues.